A BBC investigation has revealed that the General Medical Council has been recognising some British-based medical colleges that are offering worthless degrees. The validity of the degrees of hundreds of doctors from another college, one of whom works as a surgeon in the NHS, has been seriously called into question. The GMC has announced that it has suspended its recognition of the degrees of one Luton-based college and is investigating the status of four others. The UK has seen a boom in private medical colleges which use NHS facilities for training, but which eventually award degrees from foreign institutions. These "squatter schools" have to be recognised by the GMC to allow their graduates to take its PLAB test, which then allows them to practise in the NHS. There are now doubts about the validity of degrees awarded by St Christopher's College of Medicine in Luton, which currently has 400 medical students. The GMC has given recognition to the college where students can pay up to £150,000. Despite its UK location, the college's degree awarding powers come from Senegal in West Africa and St Christopher's claims to have received this accreditation in 2000. In an interview with the BBC, the director of the government's department of higher education, Momar Marieme Dieng, was asked if he was aware of any government accreditation for St Christopher's from 2000. "No, not to my knowledge" he replied, although he said the government did award accreditation to a college called St Christopher - Iba Mar Diop medical college, which did not open in Senegal until 2003. St Christopher's British campus, however, awarded dozens of medical degrees during this interim period, one to a surgeon who works in a west London NHS hospital. "They may have started its activities even before getting their agreement," Mr Dieng said. While the college claims to have received accreditation in February 2000, a Senegalese government letter obtained by the BBC, and dated seven months later, stressed that St Christopher's was starting on a process which might lead towards accreditation in the future, but that accreditation was not yet effective. The Luton college says it is mystified by the statement from the senior government official. The head of their UK operations, Allan Bain, said "We are accredited, we are supported by the government of Senegal so I really don't know what to say over and above that". On Friday afternoon the college founder, Paul Leone, showed the BBC a photocopy of what was said to be a letter from the Senegalese government accrediting St Christopher's as a medical college. The BBC has so far been unable to verify the letter. Mr Bain, who recently had £500,000 in damages awarded against him by a US court for libelling a rival medical college and poaching its students, also told the BBC that St Christopher's had regular visits from the Senegalese government to check on the quality of its teaching. Mr Dieng, of the west African government's education ministry, said to his knowledge there are had been no checks on the college. The graduates of a second British-based college called the European College of Medicine were also recognised by the GMC to take the PLAB test to become doctors in the UK. The London college claimed its degrees were awarded from a medical school in Liberia. However, the Liberian government told the BBC that no such medical school had ever existed there. 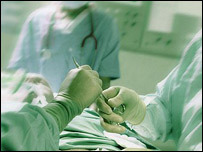 The college then told the GMC that its accreditation had switched to three respected Russian medical schools. The GMC accepted this move and told would-be students that it once again accepted the medical degrees of the London-based college. However, when the BBC contacted the Russian medical schools two of them denied any agreement had yet been reached, while one said it had never heard of the European College of Medicine. No-one from the college replied to repeated requests for a comment. As a result of these revelations the General Medical Council announced that it had suspended its recognition of degrees awarded by St Christopher's while it investigates the college's accreditation in Senegal. "We have immediately begun our own investigation, which centres on the possibility that private, UK-based, medical colleges have been inappropriately claiming that their courses would lead to the awarding of a medical qualification from a university," a spokeswoman said. "We have suspended our acceptance of the relevant medical degrees. "We have also asked the NHS Counter Fraud Service to assist us, and have amended the information on our website." The Five Live Report: Quack Qualifications? is broadcast on BBC Radio Five Live at 11 am on Sunday November 6th.